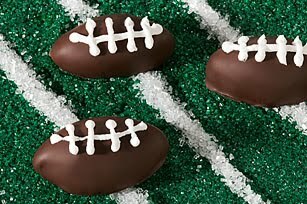 You will be a hero at your next tailgate if you make these sweet, delicious footballs (and they are so easy to make!). Directions - Mix the cream cheese and cookie crumbs until well blended. Next, shape into 40 (1-inch) football shapes. Freeze for 10 min. Dip footballs in melted chocolate and place in single layer in shallow waxed paper-lined pan. Use white icing to draw laces on footballs. Refrigerate 1 hour or until firm. Add some fun and serve on a thin sheet cake covered in green sprinkles with white sugar yard lines. How to Melt Chocolate: Place unwrapped chocolate squares in microwaveable bowl. Microwave on HIGH 2-1/2 min. or until chocolate is completely melted, stirring every 30 sec. How to Easily Dip Cookie Balls: To easily coat cookie balls with the melted chocolate, add balls, in batches, to bowl of melted chocolate. Use 2 forks to roll balls in chocolate until evenly coated. Remove balls with forks, letting excess chocolate drip back into bowl. Place balls in prepared pan; let stand until chocolate coating is firm. I made these this week (just balls, no footballs) and they were a HIT!